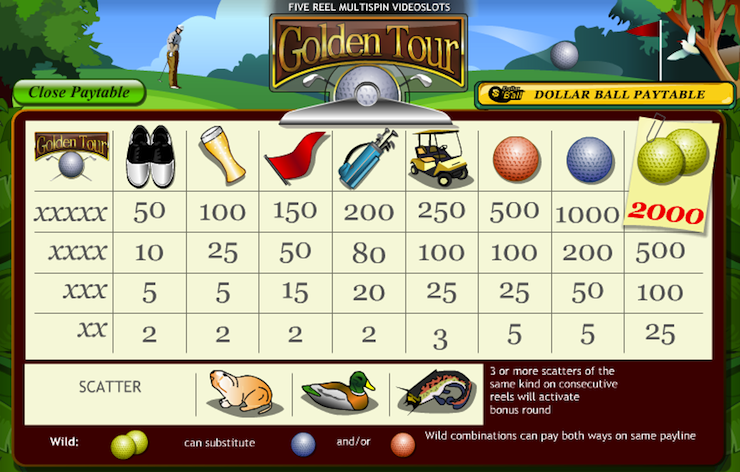 Golden Tour is a fun five reel, five payline online slots game featuring a great golf theme. The pictures are vivid and bright, the sound effects are great, and there is really no better way to hit a hole-in-one than with a winning slots combination! For this game, casinos offer coin sizes that vary from $0.01 to $5 and players can wager only one coin per activated payline, making the maximum possible bet $25 per spin. The jackpot for this game is 2000 coins which is awarded to the player when five double golf ball symbols appear on any single activated payline. The second highest payout is for five single golf ball symbols appearing on a payline, and this rewards the player with 1000 coins. The wild symbol is the Double Gold ball symbol, and this symbol can substitute for all other symbols to form a winning combination. The wild symbol does not substitute for the Gopher, Duck or the Catfish symbols, which are the three scatter symbols in this game. When there are three or more of scatter symbols of the same kind which appear consecutively, the player enters the Golfing Bonus Feature game where the player chooses an Iron, a Driver and a Putter. Depending on the golf clubs that have been chosen, the player is awarded a bonus prize. When the bonus feature is triggered by four or five scatter symbols, the bonus prize is multiplied by a factor of 5 or 10 respectively. The Gopher, Duck and Catfish symbols are the Scatter symbols. If the Golfing Bonus Feature game was triggered with four Scatter symbols and not just three, your Bonus Prize is tripled. When you enter the Golfing Bonus Feature game with five Scatter symbols your Bonus Prize is multiplied ten times. When the Golfing Bonus Feature game is complete, you are returned to the regular Golden Tour slot machine game and your Bonus Prize wins are added to your win total.